Proving once again that you can put a logo on just about anything, runners at this weekend's Penn Relays can dawn a Nike logo'd haircut cape to get a fresh cut before the races get started. Some of Nike's most famous runners including including Allyson Felix, Sanya Richards-Ross, Kerron Clement, and Walter Dix will be in action this weekend, when the Penn Relays, the oldest and largest track and field competition in the United States, get under way at Philly's Franklin Field. The activation for Nike extends well beyond the track itself though. 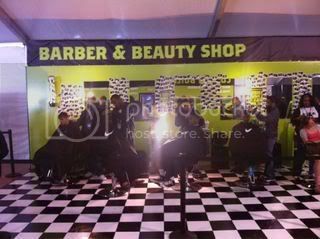 Nike's activation also includes a 50 foot customization truck, where fans can design their own N98 track jacket. To stay up to date on all aspects of Nike's activation at the Penn Relays, text SPIKE to 69866.